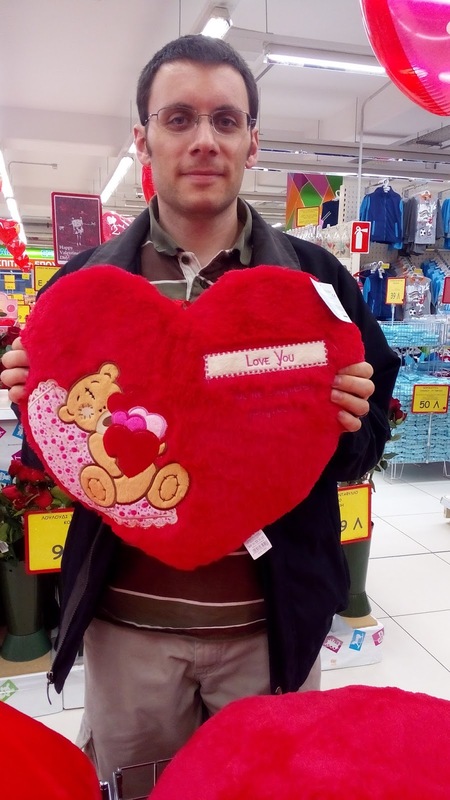 Jane and Phil and Stuff: Does Greece Have Valentine's Day? 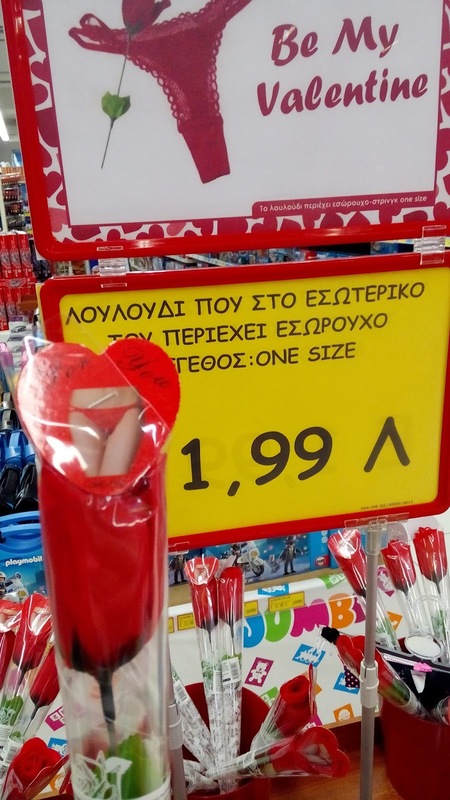 Does Greece Have Valentine's Day? 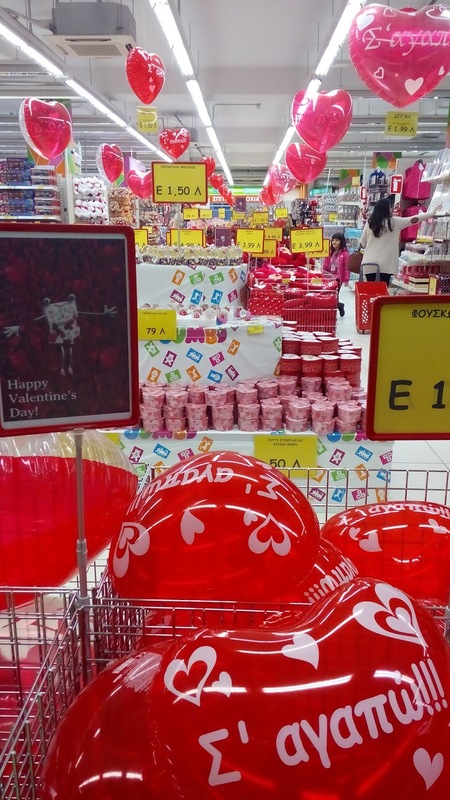 A whole aisle of cheap, plastic, red and pink crap. Don't get my tone wrong, I loved it. I wanted to buy everything. I'm a huge sucker for most Valentine's stuff. 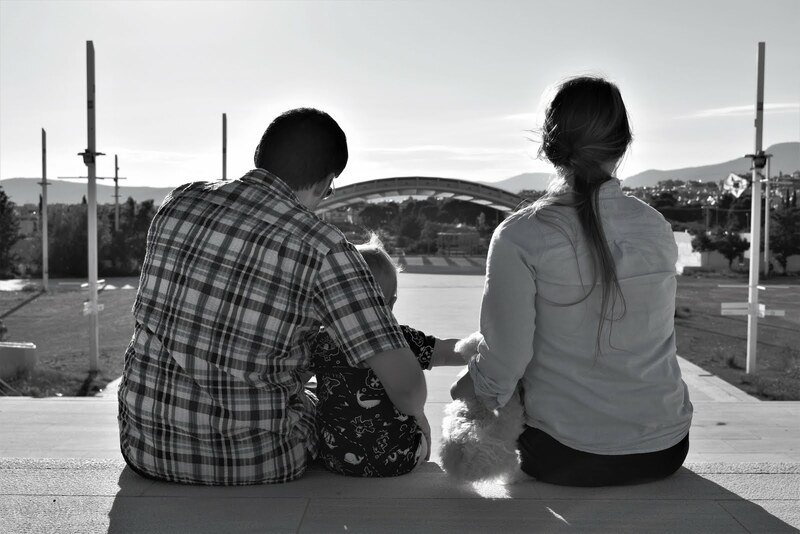 Rather than show you all the things I would buy, I decided to show you three things I would not buy. It's my V Day don't-gift guide. Nothing says, "Be My Valentine," like giving the person you love a sheer, red, lace thong packaged like a rose instead of an actual rose. Pro tip: Don't gift this unless you give the real gift immediately after. 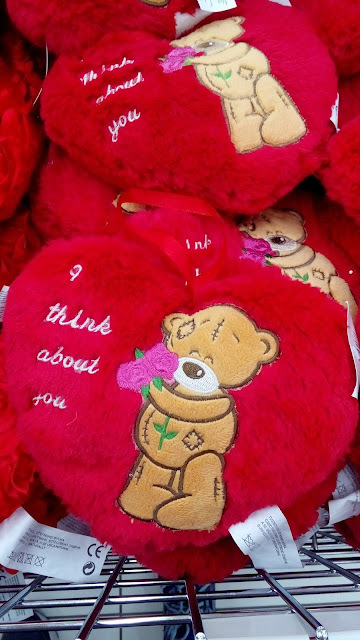 "I think about you" has got to be one of the more disturbing V Day sentiments I've ever read. And some of those conversation heart candies are pretty disturbing. There's just something about it that screams creepy, unrequited middle school crush. The bear's cute, though, except for the scarring. Why is the bear so scarred? Pro Tip: Go for a plain heart pillow. Poor Phil was feeling really lightheaded, but I still made him stop to take this picture. The pillow says, "Love You," which you can see pretty clearly, and then "You're Completely Gorgeous," underneath that in hot pink threading. I don't think the pillow is particularly terrible, it's just not that cute. Phil's cute, though. Pro tip: Hands off my spouse. It was actually really cool to see a bunch of Valentine's stuff in the store. Globalization, man. It's not just something I had to study in that pointless International Marketing class. Seeing formerly religious-ish European holidays capitalized on for profit gives me hope that maybe one day Greece will jump on the Halloween bandwagon.